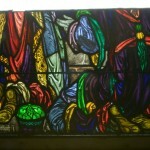 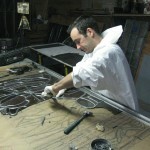 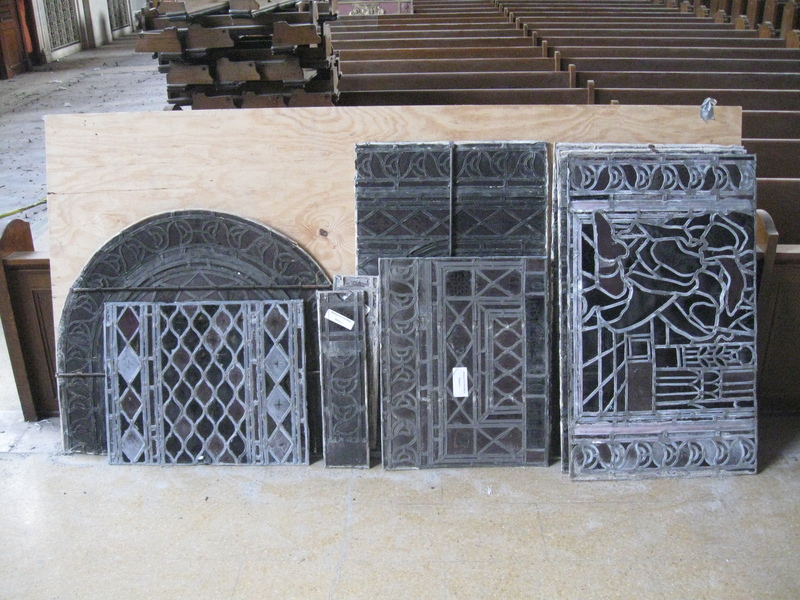 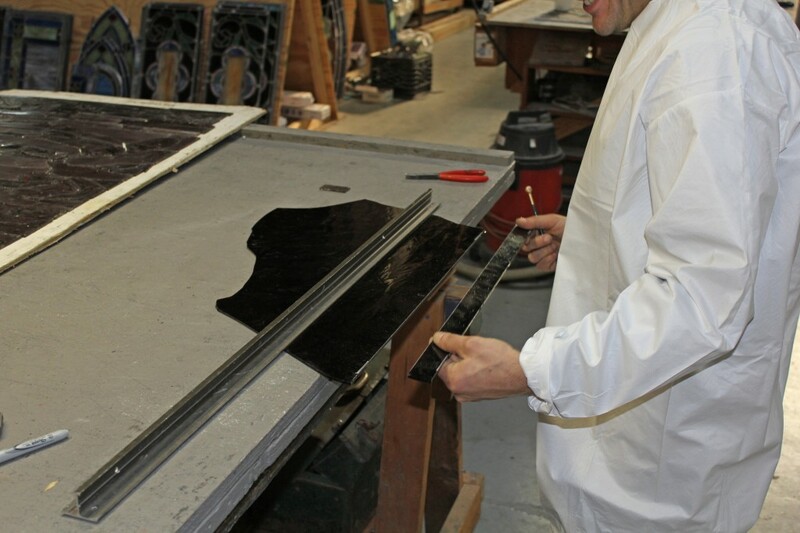 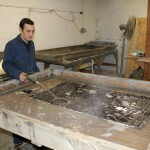 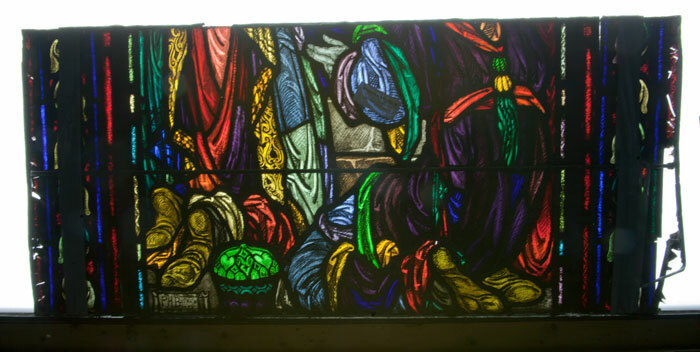 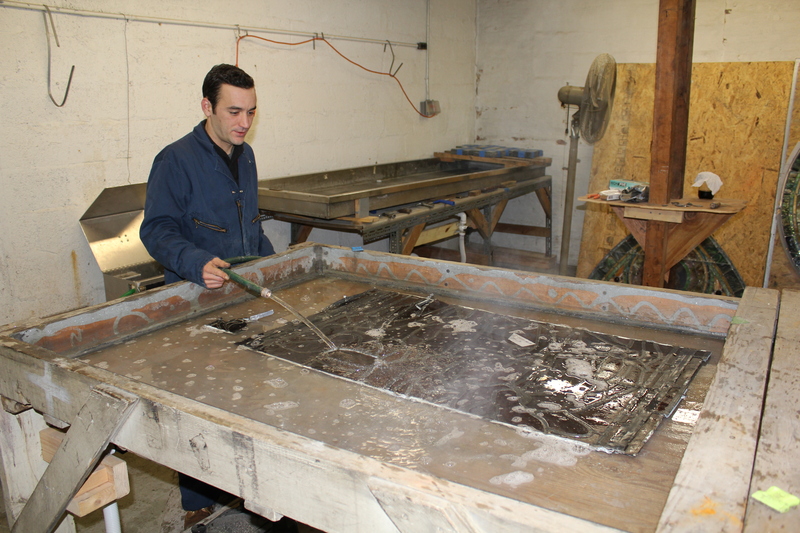 As the stained glass is removed from Ascension and brought back to Beyer Studio we will restore it panel by panel. 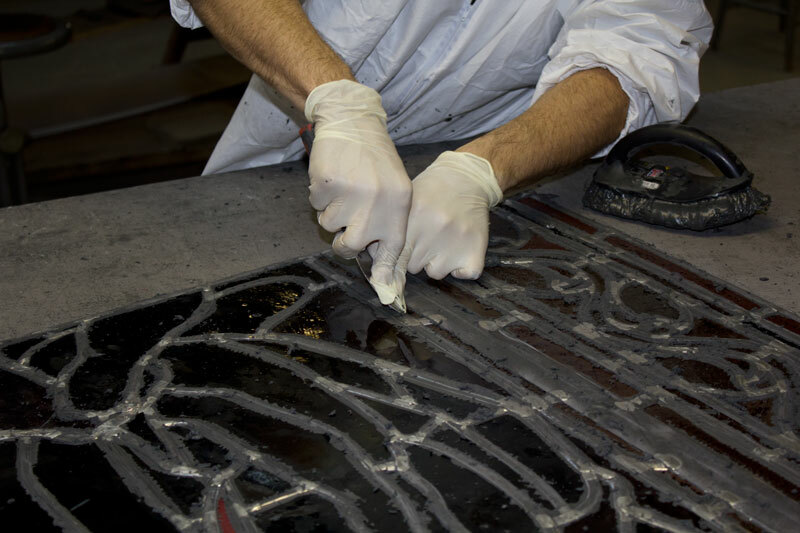 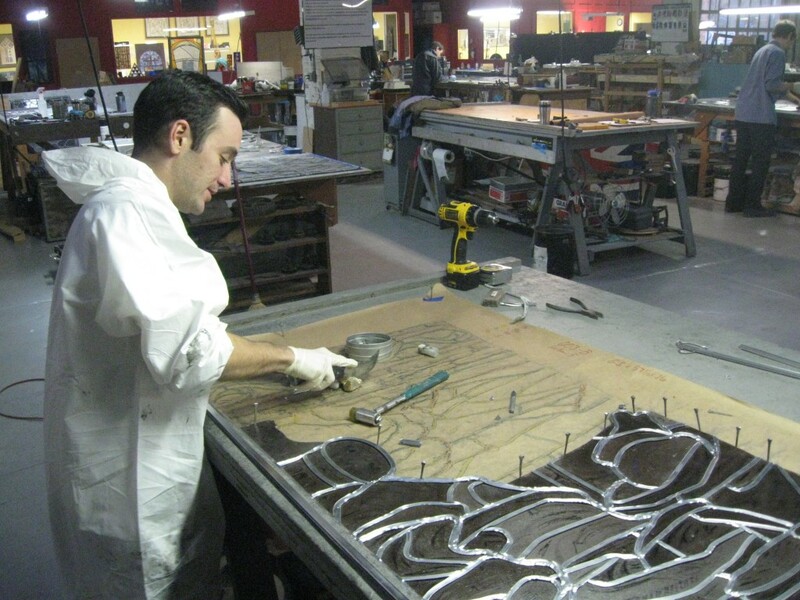 The process involves disassembling and reassembling each panel. 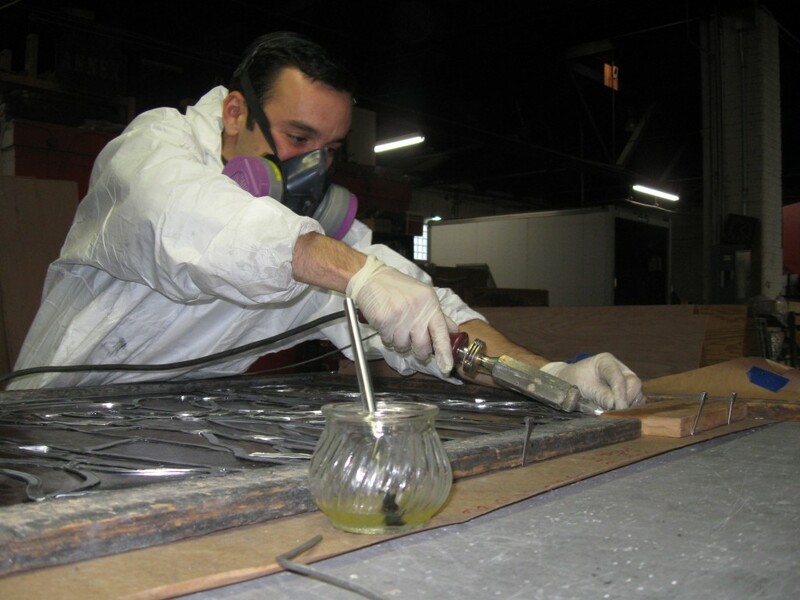 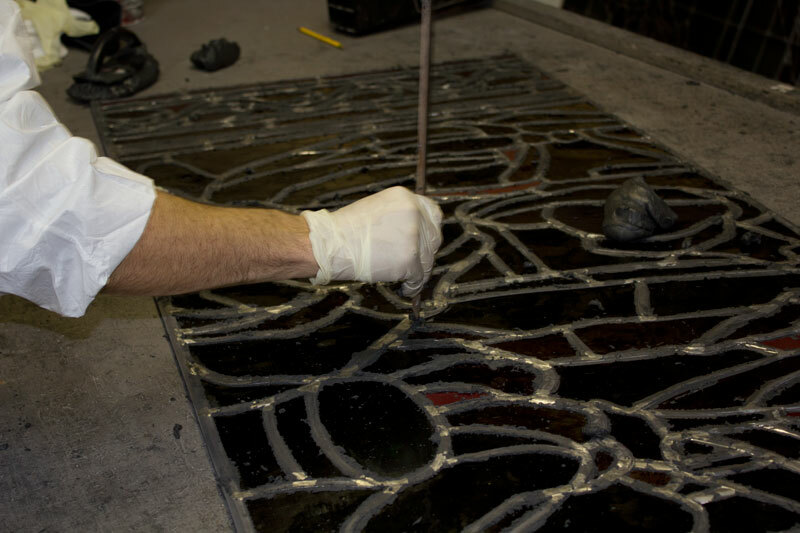 Every individual piece of glass will cleaned and, if necessary, repaired. 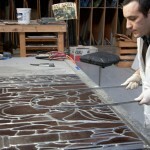 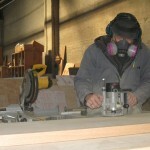 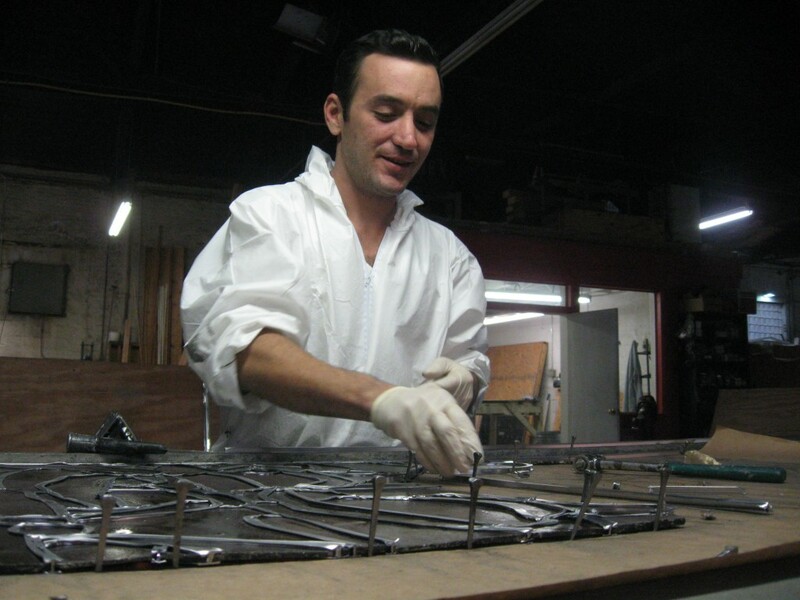 New lead will be cut and shaped to serve as the matrix holding the glass and the panels will be reinforced. 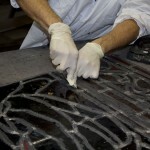 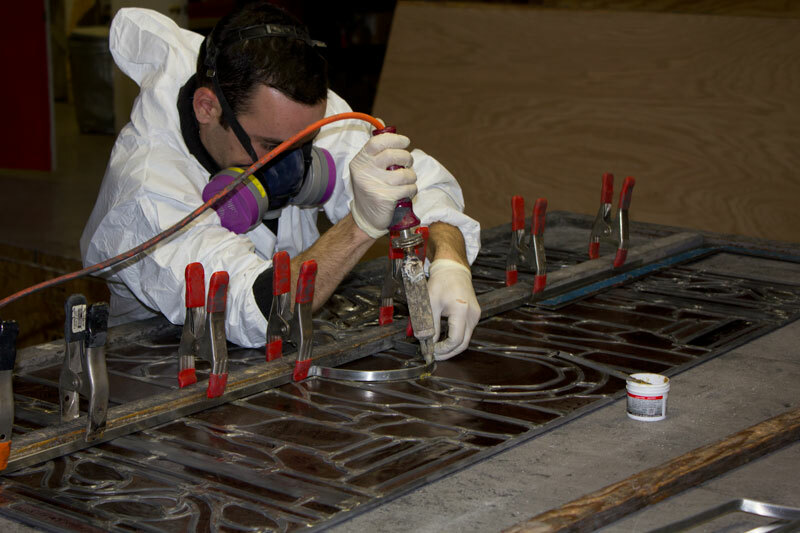 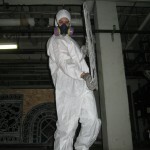 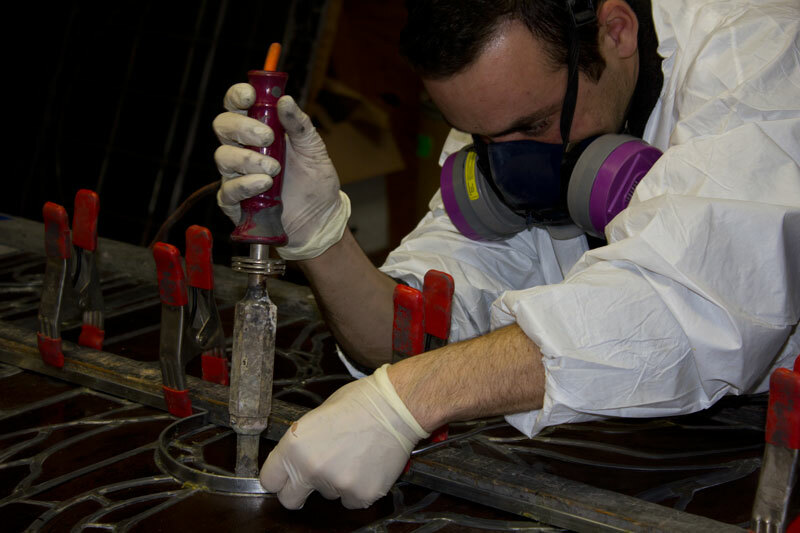 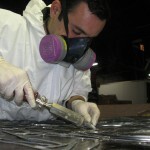 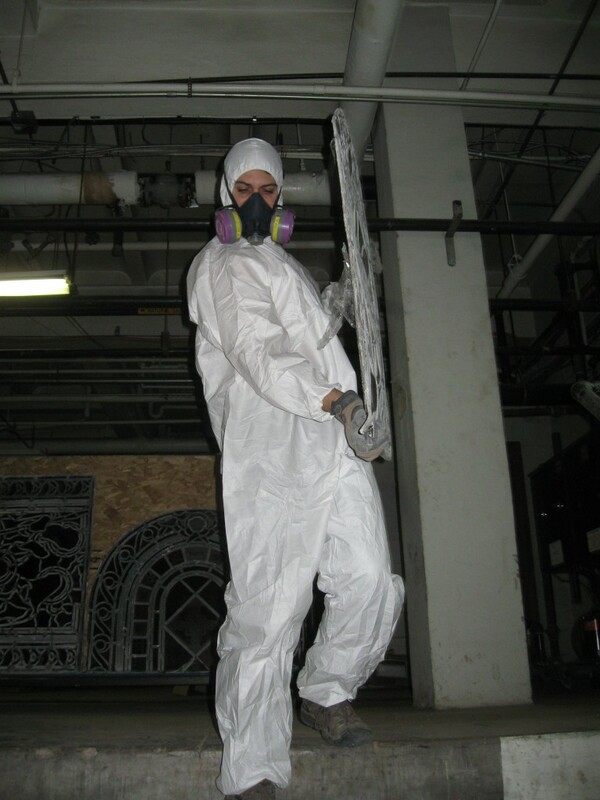 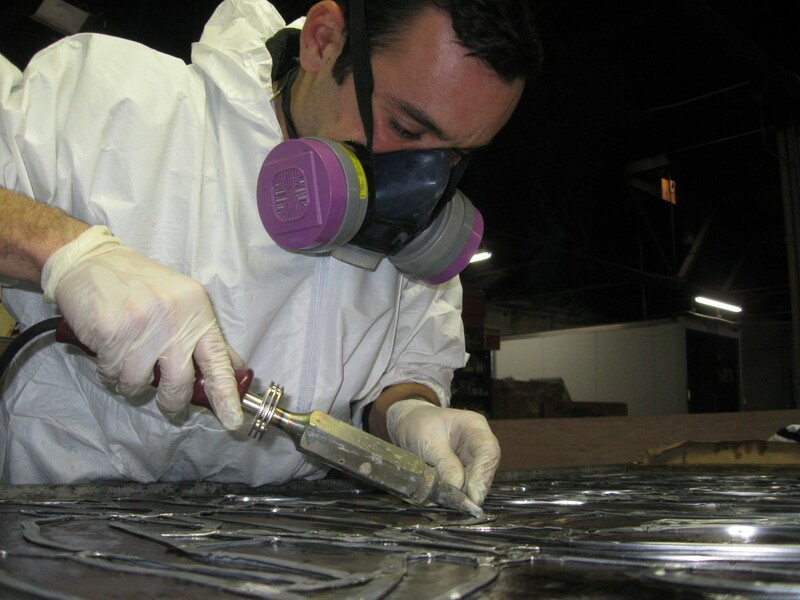 The gallery bellow will take you through the restoration process step by step. 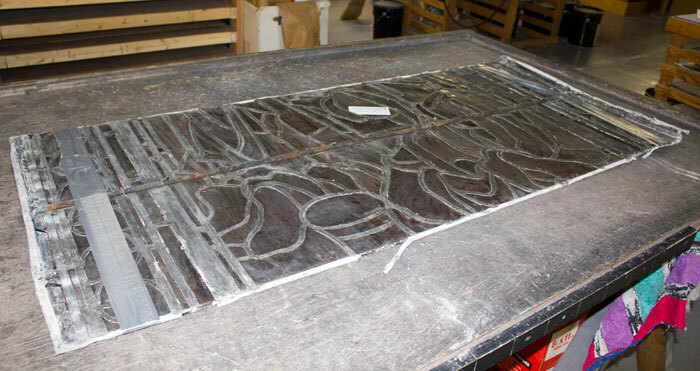 Here is a stack of stained glass ready to return to the studio for restoration. 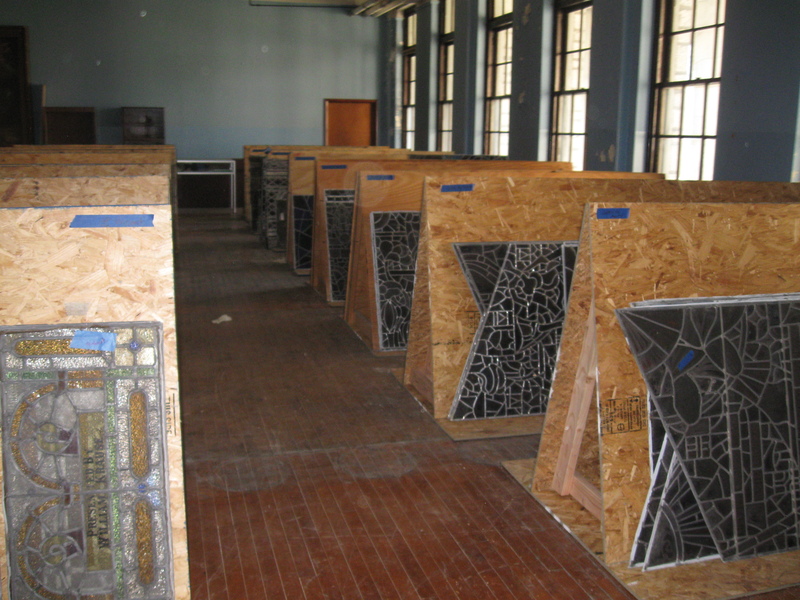 Some windows will be taken to the Diocese's storage space at St. Charles Seminary. 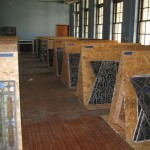 The storage area at St. Charles Seminary. 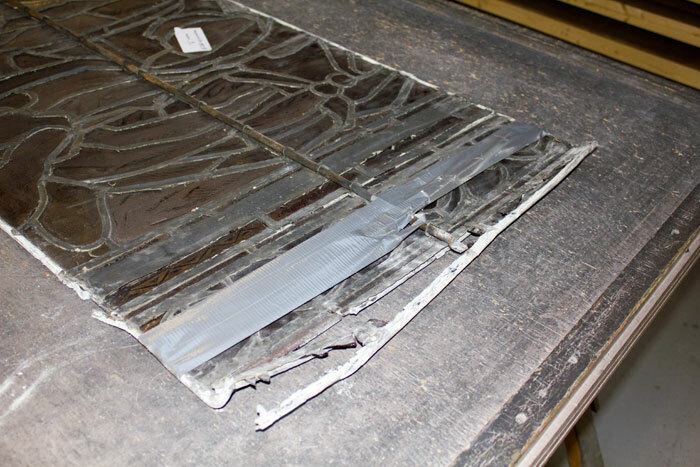 This panel is about to be completely broken down and rebuilt. 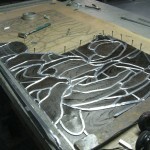 Here it is laid on a workbench. 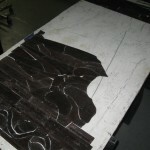 It's in bad shape. 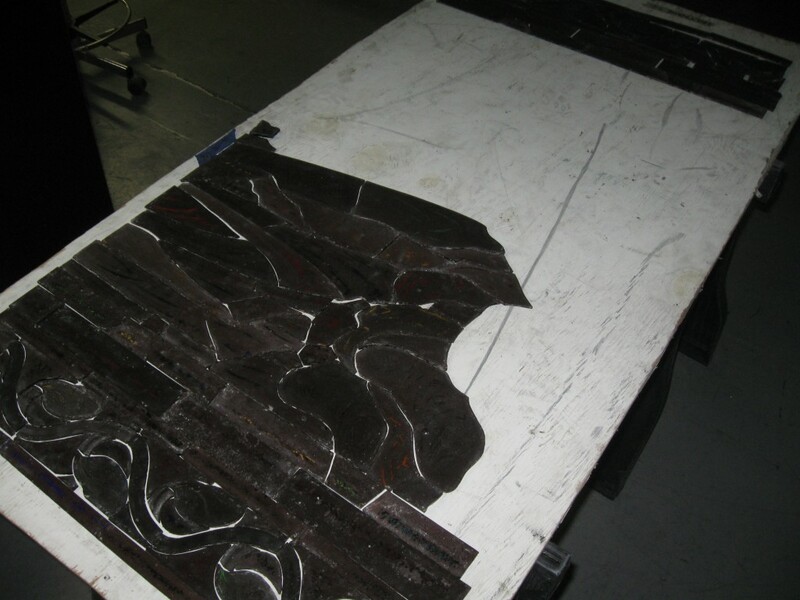 The lead is visibly oxidized and falling off in places. 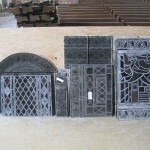 The perimeters are particularly damaged. 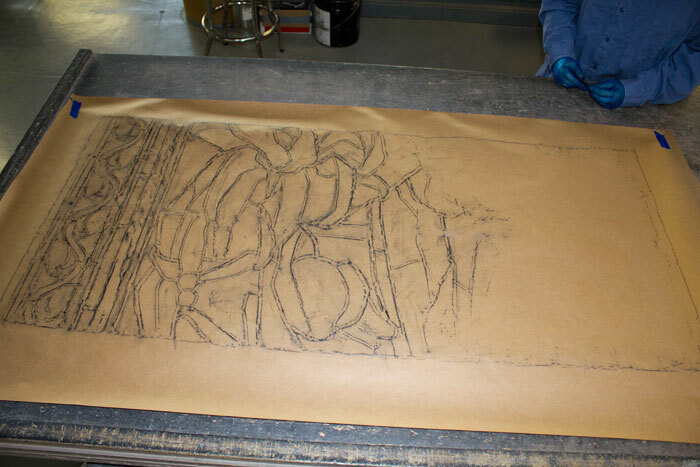 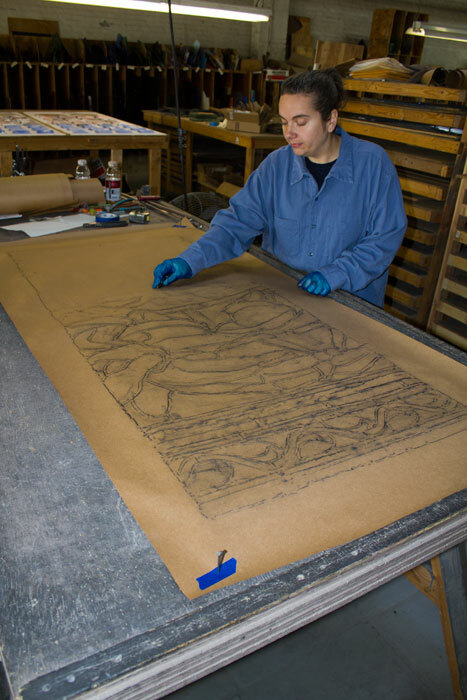 The first step in the restoration process is to take a graphite rubbing. 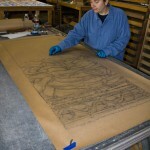 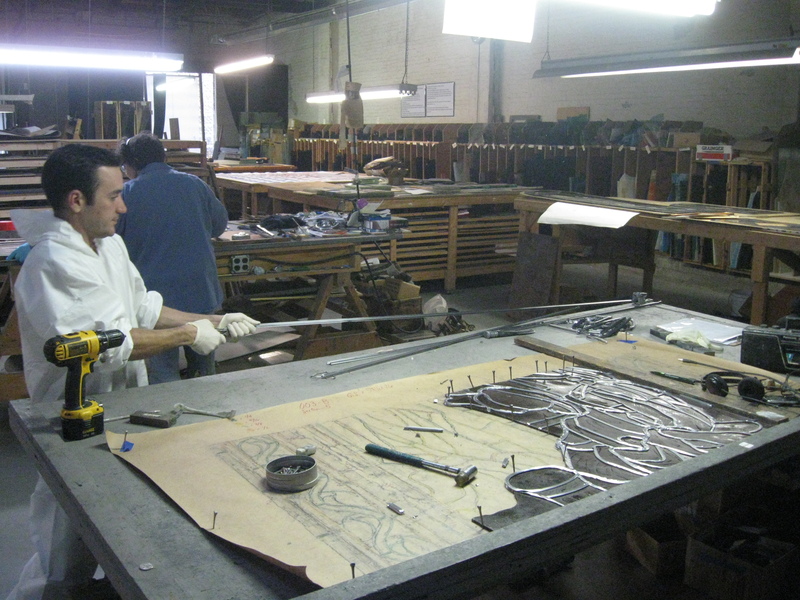 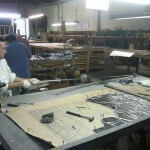 Paper is laid over the panel and the lead lines are traced. 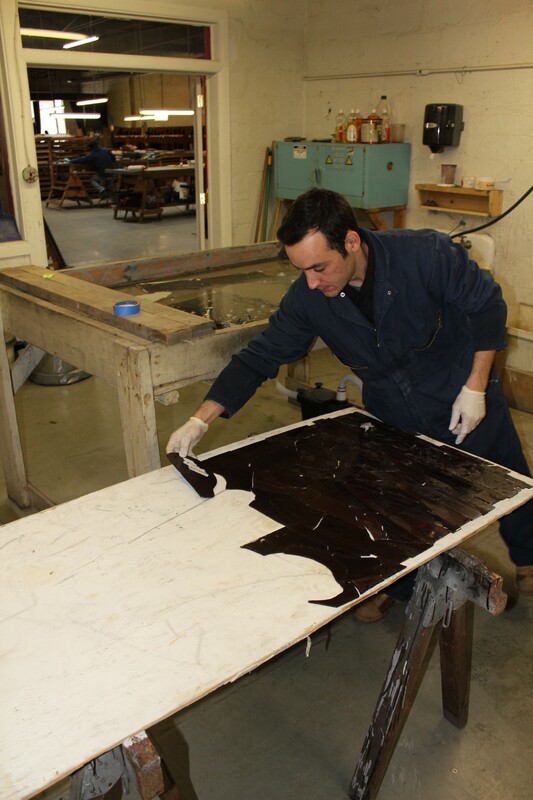 This rubbing will allow us to rebuild the panel later exactly as it was. 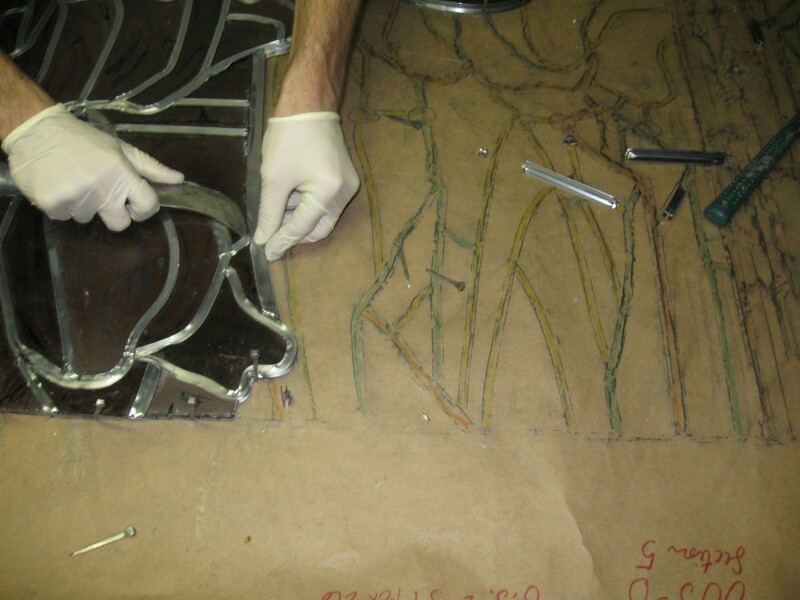 The glass must be separated from the old lead matrix. 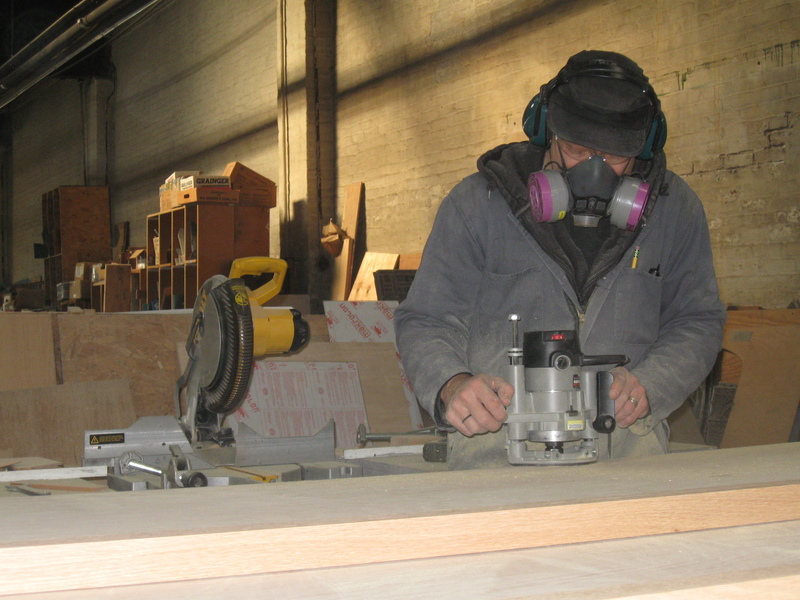 We perform this task with the window submerged in order to protect ourselves from toxic dust. 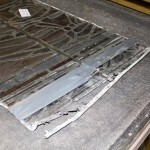 After the Glass is removed from the old lead matrix it is laid out as it was in the window. 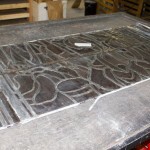 The glass from this panel laid out. 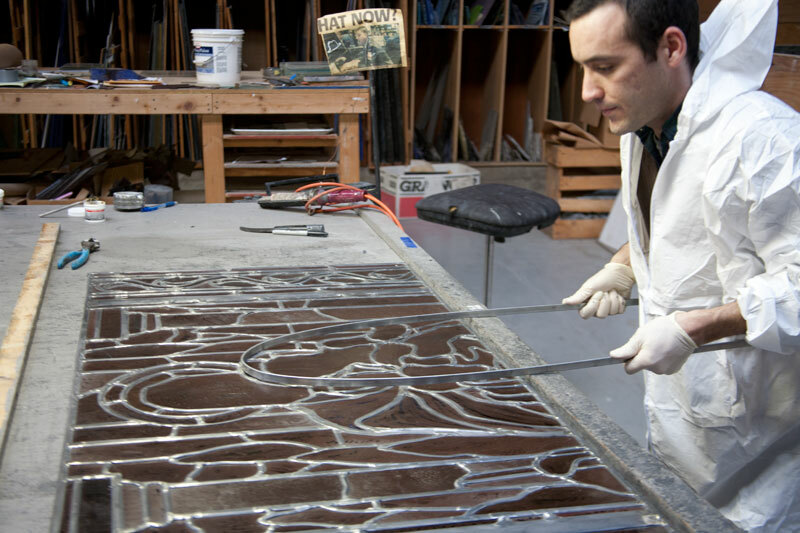 Meanwhile, Bryan is building a light box to display the stained glass. 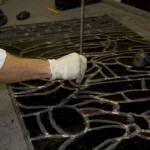 New glass is cut to replace the damaged border pieces. 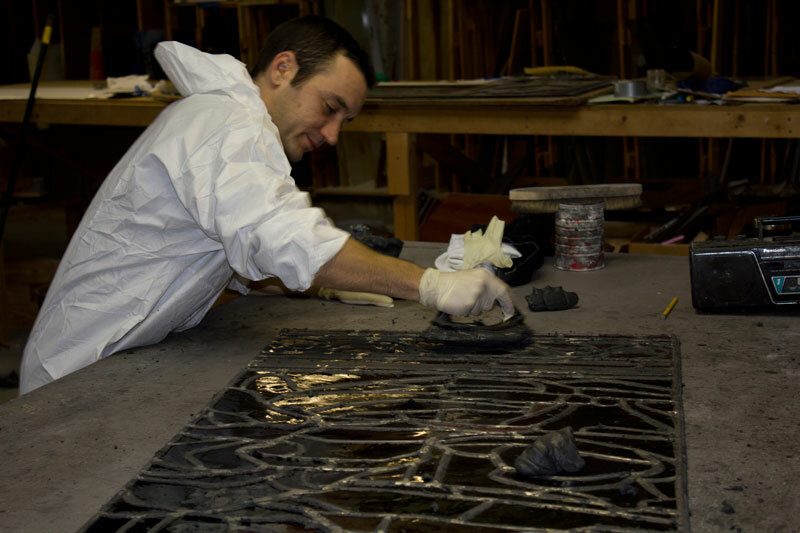 This is Tony, he is rebuilding this panel. 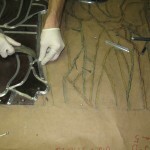 As Tony rebuilds the window he follows the rubbing which shows the lead lines. 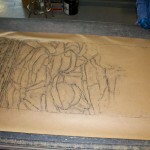 The lines are color coded to denote leads of different widths. 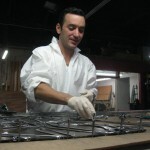 Tony fits a piece of glass into the new lead. 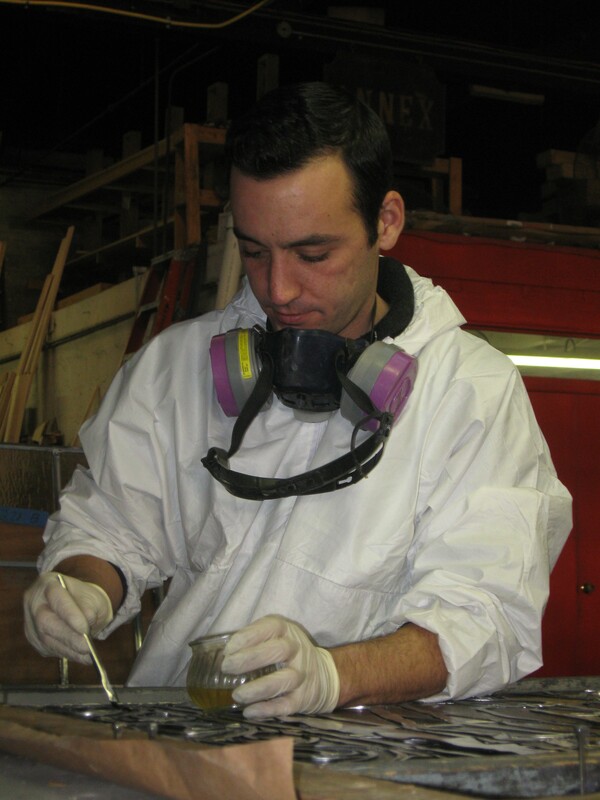 There he goes, he's really glazing it. 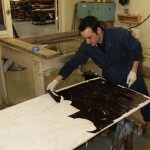 Before using a strip of lead we stretch it in order to straighten it. 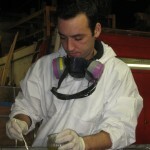 Tony is applying flux to the lead to aid in soldering. 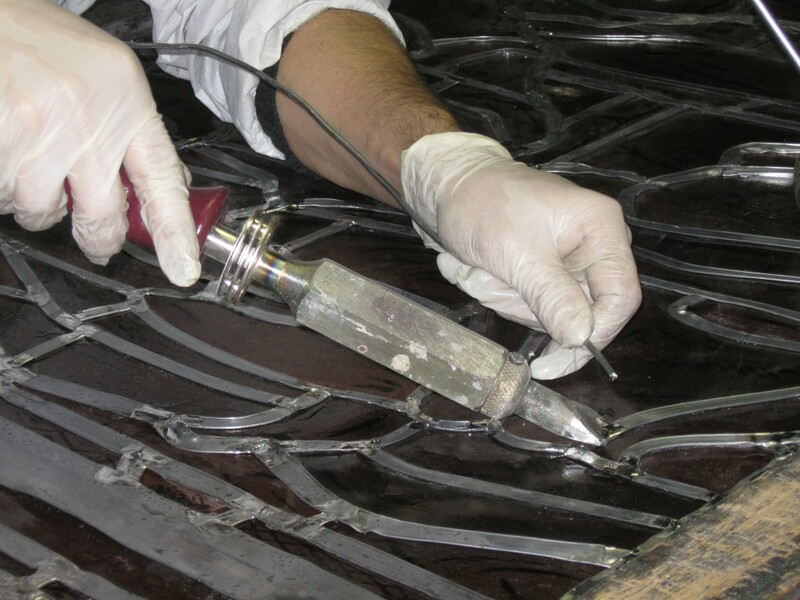 Each point where two leads join is soldered together. 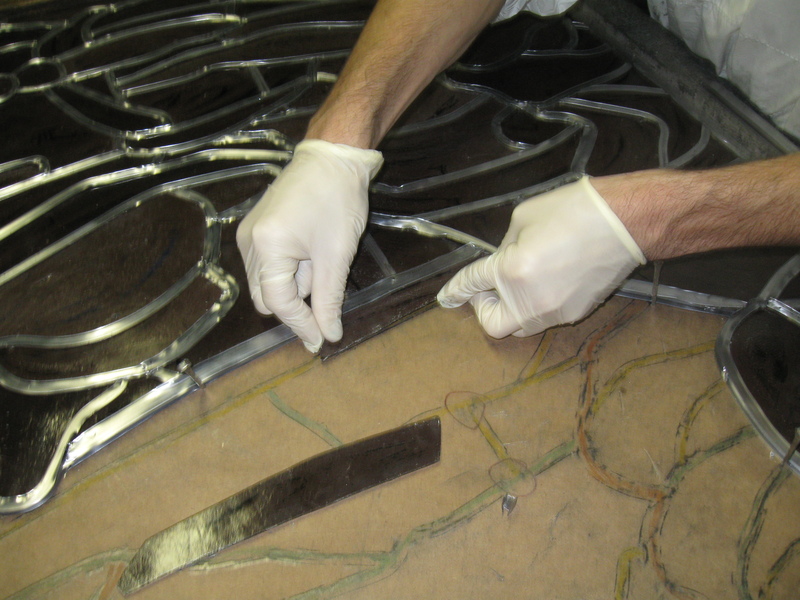 Once the window is soldered together we apply cement underneath the leads. 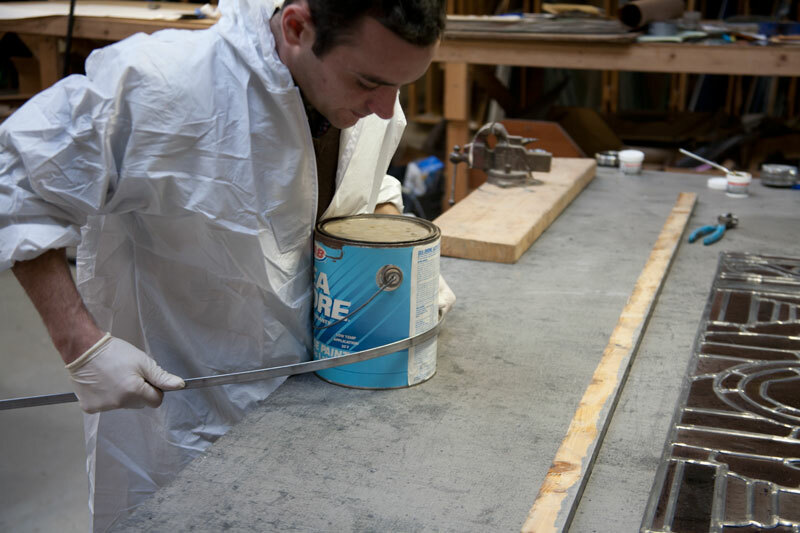 This cement strengthens and weatherproofs the window. 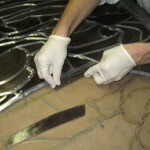 Each lead is then pushed against the glass to seal the cement in. 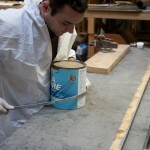 Any excess cement is removed. 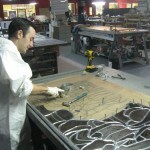 Steel reinforcing bars must be bent into shape and attached to the panel. 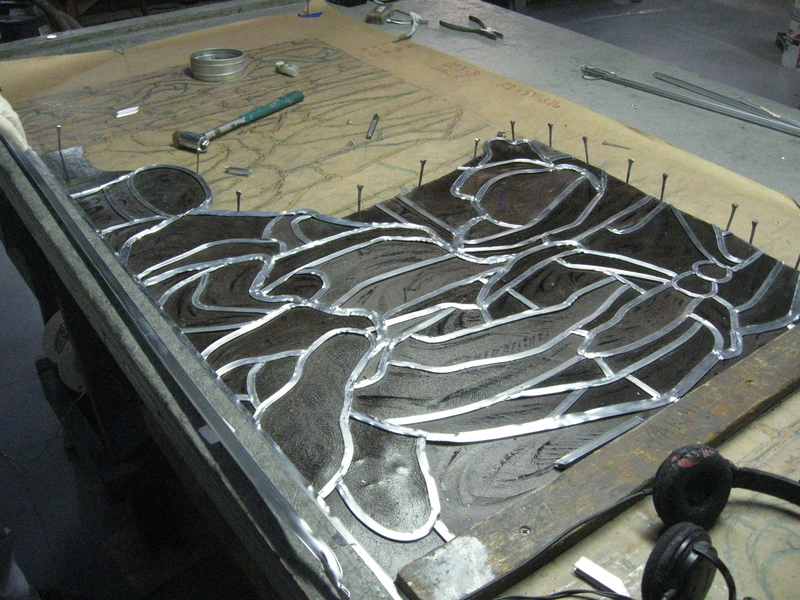 The bar has been bent to match the curve of the haloes. 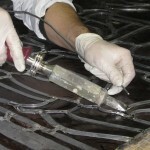 The reinforcing bar is then soldered to the window. 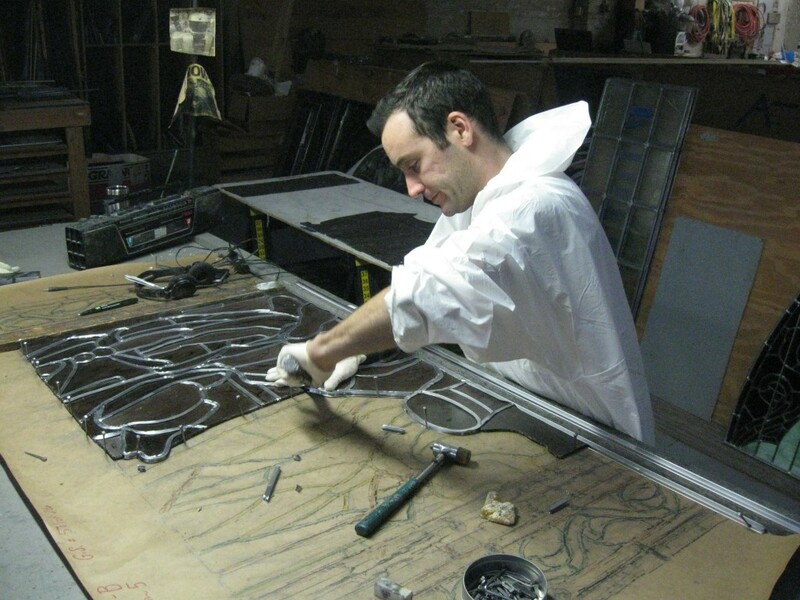 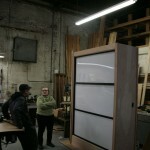 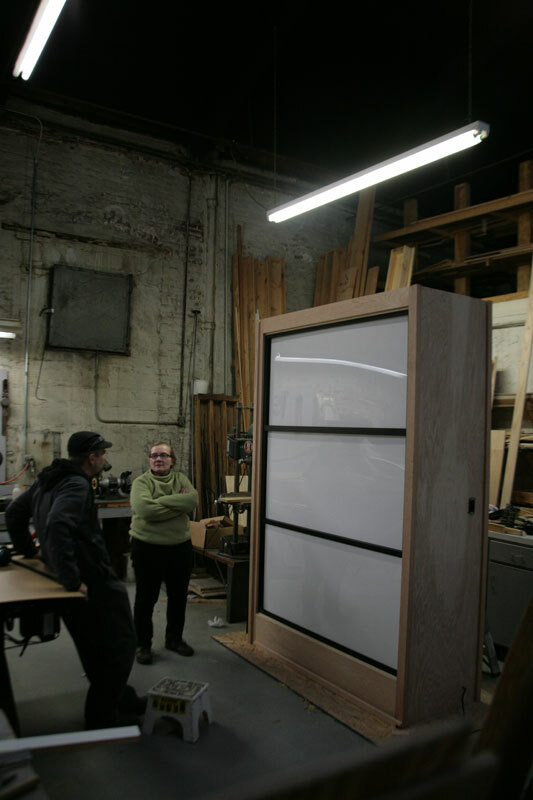 Meanwhile, Bryan has finished building the lightbox to display the panels.